The Norwood Fire Department is a full time department providing fire, rescue and emergency medical services to a thriving town 14 miles outside Boston. Norwood, founded in 1872, is home to dense residential, retail and industrial development, and is fully integrated into the greater Boston transportation network of road and rail links. In addition to the demands of serving such a built-up area, Norwood Fire is responsible for responding to Norwood Memorial Airport, a busy general aviation facility used extensively by area businesses. When the time came to choose a CAD, the Norwood department wanted a system that reflected their need for quick, accurate, and detailed response information. 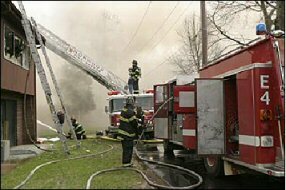 Specifically, they needed to let dispatchers share critical information in real time with responding personnel, regardless of where the information was stored, or where the firefighters were stationed. The Horizon EME satisfies Norwood’s needs via two key features: real time automatic two-way integration with the department’s existing FIREHOUSE® RMS system, and real time fire-specific mobile data that delivers important CAD (incident) and RMS (premise) data to firefighters. Taken together, the system provides Norwood with a tightly integrated system that puts the required information in the right hands, at the right time.